I received this book in exchange for an honest and open review, and I'm so grateful to Walker Books for sending it. When I started reading this book, I had no idea what to expect. I'd heard that it was incredible without knowing anything about it. One of my favourite things is that even after reading I still don't know how I'd categorise it. The Loneliest Girl draws on several genres and is a compelling, unpredictable read. I usually find that I have some idea about where a book is going, and I loved that I couldn't predict this one at all. The short chapters and extracts of fan fiction also contributed to this book being impossible to put down. Tension gradually creeps up and builds to a feverish intensity by the end, made all the more suffocating by the space ship setting. The voice of this book also feels realistic and relateable. It was so great that it dealt with subjects like mental health, periods and the effects of isolation in a sensitive, believable way. I wish this came up in more books with genre elements. Romy is one of my favourite YA characters of all time. I wish this book was around when I was a teenager - I would've related so much to Romy (even more than I do now). Her reactions to everything were understandable and I felt like I really knew her by the end of the book. There was a really good balance of backstory and forward momentum of the plot. This was an absolutely brilliant book that I'm already planning to read again. If you liked the sound of this, try the Across the Universe series by Beth Revis. 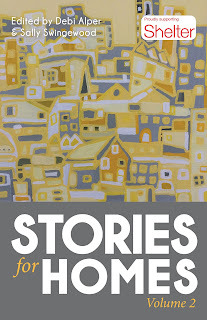 Published and unpublished writers come together to create an anthology of stories about what ‘home’ means. 55 writers are included in a second charity anthology that brings issues around housing, poverty and crisis to life through the power of storytelling. 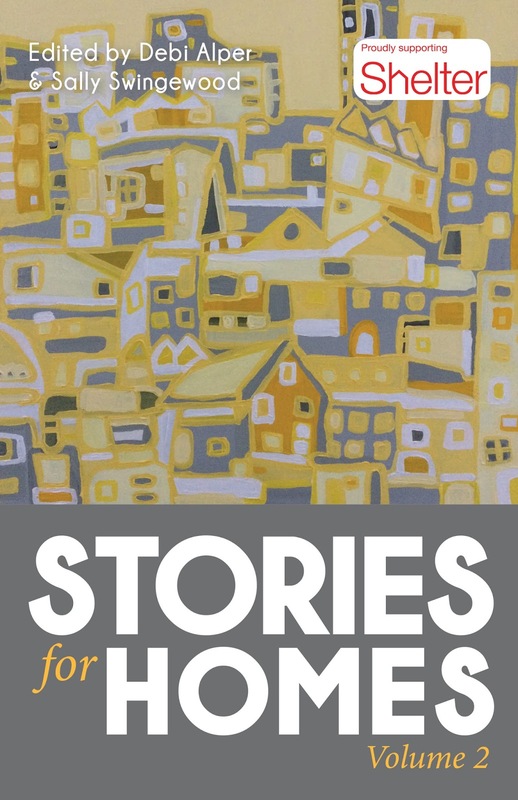 Volume One of the Stories for Homes Project raised over £3K for housing charity Shelter and raised awareness of housing issues.Volume Two of the anthology includes stories, poems and flash fiction and again all proceeds will be donated to the charity. It's a rare book that is so brilliantly written and edited, at the same time as raising money for such a worthy cause. It's also one of my favourite adult books, and short story anthologies, that I've read this year. If those aren't good enough reasons to go out and buy this book immediately, let me share a few more. As a whole, this anthology covers a huge range of subject matters and writing styles, but is unified by the theme of what home means. I really enjoyed the fact that this was a varied reading experience, with an insight into the lives of people from different cultures and backgrounds. It also gives a lesson in how to be economical with words. Though some of the stories are only a few pages, or verses, long, they are written with such consistently strong voices that I immediately felt present in the world they created. The stories were consistently interesting and thought-provoking, but I had a few favourites. Day 89 is a really touching story about refugees that made me feel intensely for the characters, and also made me think about the privileges it's all too easy to take for granted. The Tiger Who Came Back to Apologise takes a very creative approach to the subject matter, and at the end of the book was the one that stuck in my mind. Straw Houses also stood out for the humour, voice and immediacy of the writing. It made me want to read a whole book written by Caroline Hardman. This is a thought-provoking book that had me thoroughly engrossed throughout. I strongly recommend it for the storytelling and the motivation behind it. A dedicated website includes a further collection of flash fiction and poetry, real life experiences from people who have had housing problems or have experienced homelessness, as well as a series of articles from a professional working with homeless people. 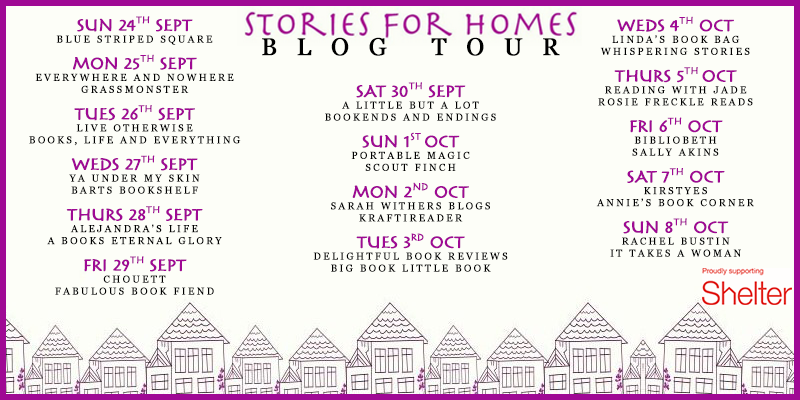 I'm so happy to be on this Blog Tour. Stalking Jack the Ripper was a standout read of last year for me and this book was just as intriguing, scary and romantic. I have some information about the book, handy links if you want to purchase it, and then I'll get onto my review! At the end of the post, there's a rafflecopter giveaway for US and Canadian residents. Part of the reason I love these books so much is that I haven't read anything like them. The premise of solving crimes based on these well-known characters and figures is really distinctive. The voice of this book is incredibly strong, evoking the feel of something written at the time period as well as exposing Audrey Rose's frustrations with the way women are treated. 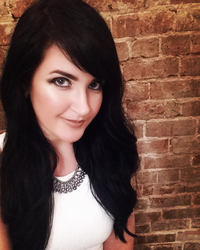 Audrey Rose is an amazing character - she's strong willed, intelligent and curious, a perfect combination for a main character in the midst of a series of murders. She went through traumatic events in Stalking Jack the Ripper, and her reaction felt very authentic in the sequel. I'm also a huge fan of the relationship between Audrey Rose and Thomas! I absolutely love that she didn't just go all aflutter at the sight of him and that was it; she was very clear that having feelings for him didn't diminish her as a person. This book could easily have fallen into this trope because of the time period and it's so great that it didn't! I'm really into the Gothic genre and this book captures my favourite aspects perfectly. The setting, delightfully gruesome descriptions and plot development all create a spooky and sometimes terrifying atmosphere! The plot of Hunting Prince Dracula builds in intrigue and tension until the very end. It's crafted so well, in terms of feeding in details and leaving questions unanswered that kept me reading. This is my favourite historical YA series and I can't wait for the next book. 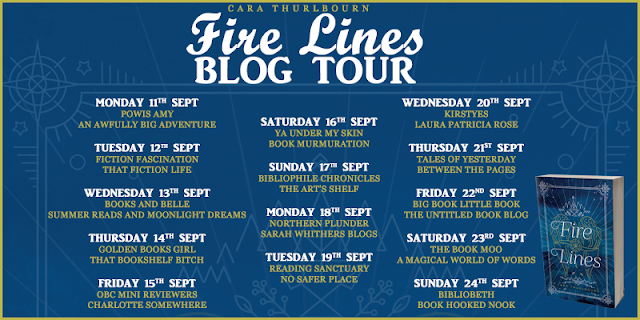 You can follow the blog tour using the schedule here for more reviews, promo posts, interviews and creative posts. Moonbeam is starting to doubt, though. She's starting to see the lies behind Father John's words. She wants him to be found out. This is one of those books that actually lives up to the hype online and I'm grateful to the bloggers who recommended it! It won't be a book that I'll easily forget. A creeping sense of unease builds throughout and I can't think of another book quite like it. 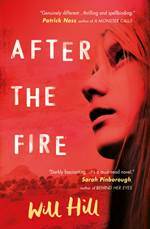 The premise is totally unique and the delivery is impeccable, through an irresistible back and forth of before and after the fire. The controlling world that Moonbeam lives in is unbearably awful and believable at the same time. Moonbeam is a fascinating character. She seemed very real to me and her reaction to the events felt authentic. It was really interesting to follow her journey of realisation about what her world was really like. The first person narrative voice came across as really strong, sounding like a real person and also reflecting the strength of Moonbeam's character. The plotting of this book was great too. It released information gradually, which led to an exciting experience of trying to piece the truth together. This has been such an amazing year for books. I keep thinking I've found my favourite of the year, and After the Fire is definitely up there. It's one of the most gripping and unpredictable books that I've read for ages! If you liked the sound of this, now try Blood and Salt by Kim Liggett. When your blood line awakens, how do you choose between family and freedom? Émi’s father used to weave beautiful tales of life beyond the wall, but she never knew if they were true. Now, her father is gone and Émi has been banished to the Red Quarter, where she toils to support herself and her mother – obeying the rules, hiding secrets and suffering the cruelties of the council’s ruthless Cadets. 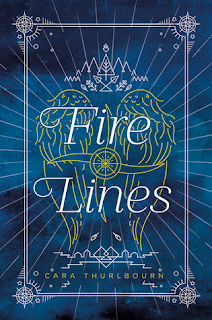 But when Émi turns seventeen, sparks fly – literally. Her blood line surges into life and she realises she has a talent for magick… a talent that could get her killed. Émi makes her escape, beyond the wall and away from everything she’s ever known. In a world of watchers, elephant riders and sorcery, she must discover the truth about who she really is. But can the new Émi live up to her destiny? The premise of this book got my attention and I liked how it started right in the action. Immediately, it set the scene of this disturbing dystopia where people are divided and their lives could be ripped apart at any moment by the cadets. This created a real sense of unease early on, which made me root for Emi as a character. She was really likeable, even though I couldn't always see the motivations behind her actions. I was intrigued by the fantastical elements of this book and the mythical back story was inventive and well-developed. Even though it's a story line that comes up a lot, I enjoy books about characters coming into their magical abilities. From the engaging opening, the fantasy world continued to be one of my favourite parts of this book. This was a promising start to a series and it establishes an interesting world for fans of YA fantasy. I received this ARC from the publisher in exchange for an open and honest review. I love being terrified: horror films, haunted houses and ghost tours are the perfect ways to get my adrenaline pumping. It isn't often that I'm genuinely scared, and then Frozen Charlotte came along and I was seeing the blur of moving dolls in my peripheral version. Charlotte Says is the same perfect combination of scares, shocks and building tension. I think this is the first prequel horror novel that I've read, and it worked really well. If you haven't read Frozen Charlotte, I still recommend reading that first. It was really exciting to see elements of Frozen Charlotte being developed and explained in Charlotte Says. Alex Bell has an amazing talent for setting the scene, and she uses the remote location on the Isle of Skye to it's full creepy potential. The scares come gradually as the unease unravels, and Jemima starts to realise the horrible truth about the Frozen Charlotte dolls. Another thing I love about this book is that Frozen Charlotte dolls are a real thing, based on a wonderfully disturbing poem about a girl who freezes to death. It was such a clever idea to take this disturbing reality and turn it into a novel. Again the execution was great and I loved the fact that these real elements were worked into the plot. I'm really excited to read The Polar Bear Explorers' Club by Alex Bell (which is aimed at younger readers and waiting on my tbr pile) but I also hope that Alex Bell writes more horror. This a perfect read for the build up to Halloween (yes I've started counting down) and is now one of my favourite YA horrors. If you're in the mood for more YA horror, try The Dead House or The Creeper Man by Dawn Kurtagich. 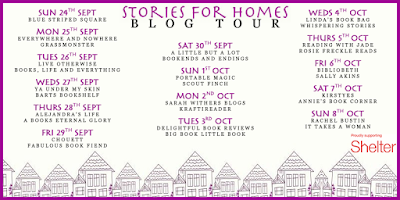 I'm so happy to join the blog tour for this amazing book. Ruth Lauren has shared the books that inspired her, and then I'll tell you all the things that I loved about this book! Hi, and thank you for having me on YA Under my Skin! 1) One from my childhood, THE WOLVES OF WILLOUGHBY CHASE. I adored this classic, and still do. 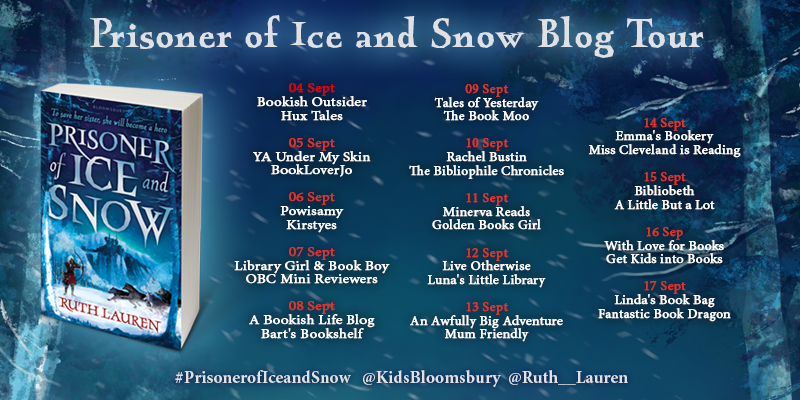 Wolves, snow, girls—if you’ve read Prisoner, you’ll see the influence! 2) Katherine Rundell’s THE WOLF WILDER. This book is gorgeous and brilliant. 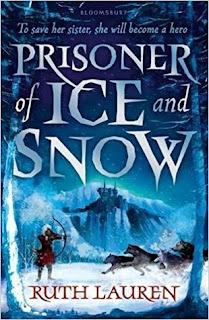 The Waterstones website uses this book and the next one in an ‘if you liked this then try Prisoner’ capacity and I am completely thrilled about that (even if it is entirely to do with the frozen Russian setting). 3) THE WOLF PRINCESS by Cathryn Constable. 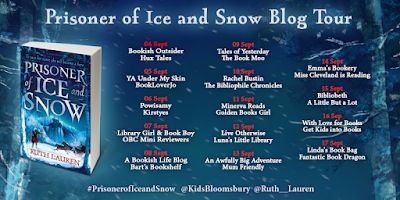 Another comp on Waterstones website with a wonderful Russian setting and an exciting adventure filled with girls. 5) SCENE AND STRUCTURE by Jack Bickham. This is a writing craft book with the subtitle ‘How to construct fiction with scene-by-scene flow, logic and readability’ and I found it endlessly helpful. If you’re a writer and you haven’t read it, I highly recommend! Thanks so much for sharing your inspirations Ruth! I'm fascinated by the books which influence authors that I admire. Now it's time for my review, and I have so many good things to say about this book! I haven't read any middle grade books for ages and this was a fantastic book to get me back into them. My absolute favourite part of this was the relationship between the sisters. I love books for all ages that explore sibling relationships and this book did it so well! It was great that both sisters had different strengths and how much they loved each other. I related to both of them and I think they'll appeal to a lot of people. Valor was probably my favourite character because she was so brave and resourceful. Like Ruth, I also love a girl with a bow and arrow! It was great to see so many women in this book who had personal strength and political power. My least favourite fantasy trope is worlds where men are considered superior and I really appreciated how this book smashed stereotypes to bits. The plot was so exciting that I had to read this book in a couple of sittings, and I haven't done that for a long time! It was so much fun to work out Valor's next move. This is a fabulous book for a middle grade audience and for anyone who wants adventure and great characters! There are lots of amazing spots on the tour to come and you can check them out below.